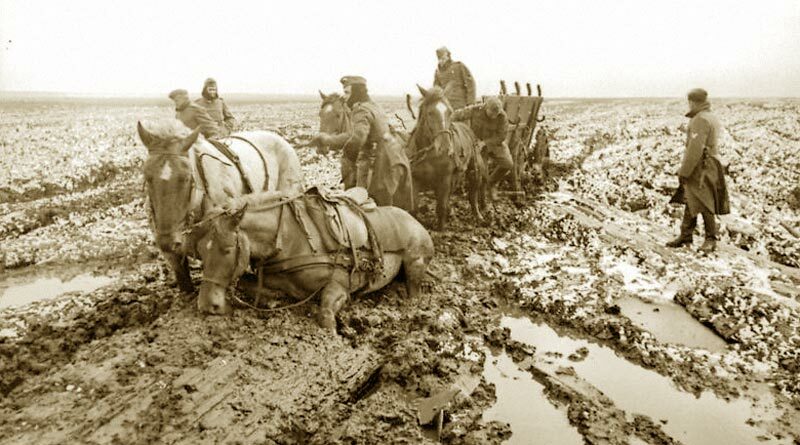 Horses carrying ammunition in the mud at Flanders in WWI. The story of the American horses and mules who served in World War One has been documented in an exhaustive website in a collaboration between the US WW1 Centennial Commission and equine welfare charity Brooke USA. There are hundreds of photographs on the site, and it is perhaps the single most inclusive collection of photos of US horses and mules in WW1 collected in one place. There is also hundred year-old motion picture film that will eventually be available on the site. Carefully brought to life by Brooke USA volunteer, lifetime horse enthusiast and avid historian Jo Ellen Hayden, the new web pages offer a very in-depth look at multiple facets of World War One history. Some of the pages are still under construction, but already the site has gone a long way in providing a permanent record of the valuable role played by American equines in the war. Field Remount Squadron No 306, picture taken in Germany, 1918, from left, Lt Warden, Crame, Fisher and Ehrenburg. During the war, animals were a commodity, and just as armed forces routinely left hardware and vehicles behind rather than pay to transport them back to the US, the horses and mules were disposed of wherever they happened to be at the end of the war. Some were sold to be slaughtered, as human consumption of horse meat was common in some parts of Europe. Others were sold as farm or utility animals to the local populace. At least 8 million horses and mules were used by all the various countries involved, and of those, at least 1.2 million came from the United States. Only about 200 equines returned to the US. Brooke USA traces its roots to Dorothy Brooke, who rescued 5000 former war horses and mules who were left behind in Cairo by the British Army after the war. The charity subsequently named in her honor, Brooke, has over the past 84 years become the world’s largest international equine welfare charity. Brooke USA raises funds to support Brooke’s equine welfare programs in some of the poorest countries on earth. Mules on the front line. For the new web pages, Hayden included many facets of information a history buff or horse lover may want to access in their research of the war and its equines. The site features general horse information as well as extensive background information on the war’s location, history and what life was like during that time period. Viewers will find topics such as Training for War, Harness and Saddlery, the Cavalry, Purchasing and Shipping, and much more. The Horse Heroes web pages even have a special section devoted to mules, whose hybrid horse and donkey lineage made them extremely hardy and useful in the difficult battlefield environment. Today Brooke USA honors Dorothy’s war horse veterans by helping working horses, donkeys, and mules in many countries. By continuing to educate owners on sustainable practices, nutrition, and veterinary care, with a staff of more than 900 equine professionals, Brooke improves the lives of millions of animals, benefiting millions of people who depend on them, each year. At our Royal Canadian Legion I teach school children about remembrance and the past two years have had a spot about animals. I would appreciate receiving additional stories.